This new form of vitamin D3, extracted from sheep wool lanolin, is not a replacement for the existing product listed in the SuperSmart catalogue, which delivers a 5000 IU dose. A smarter and more practical option, it does however represent unbeatable value for money, with positive health effects that include – but extend well beyond - vitamin D’s established benefits for bones and joints. Over the last 30 years or more, vitamin D has been growing in popularity, due mainly to the discovery of new health benefits over and above its regenerative powers for the osteoarticular system. Each of the body’s cells needs vitamin D3 to ensure regulation of more than 2000 genes. But as these needs are not sufficiently met through exposure to the sun, supplementation is essential. Nonetheless, it is a good idea to first have a blood test to determine your vitamin D3 status: this test will analyse levels of a vitamin D metabolite called 25-hydroxy vitamin-D (25-OH-D). • stabilises hearing and protects against hearing loss. In addition to all these functions, it has a positive impact on obese individuals: it is fat-soluble and so has a modulating effect on fatty tissue. It also protects pregnant women and elderly people against loss of melanin, the pigment that gives skin a healthy colour. Lastly, research suggests it may play a role in sleep and weight control, though the precise mechanisms involved are not yet fully established. Unfortunately, the low level of vitamin D generally available from food (with the exception of eggs, liver and oily fish) is insufficient to ensure we benefit from all these functions. 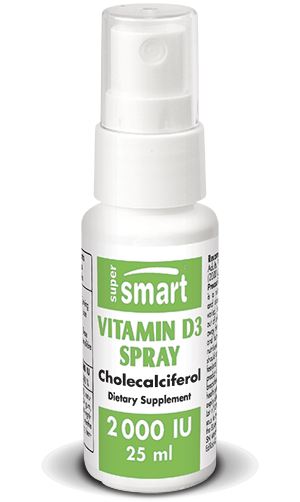 Vitamin D3 in the form of a measured dose spray, free from additives, colourings and all other ingredients, is a smart choice. Unlike pills or tablets which may be poorly tolerated in the stomach, this form is absorbed immediately, passing straight into the circulation, tissues and cells, making the vitamin instantly available for use by the body. The normal dose is 2-3 sprays every 24 hours. It is even more beneficial when combined, as is frequently recommended, with methylating agents (vitamin B12), melatonin and in particular, vitamin K2. To maximise the effects, keep the sprayed dose under the tongue for around 20 seconds before swallowing.